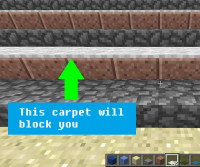 If there is a carpet above a step on a stair the carpet prevents you to walk over the step. You have to jump over the carpet to continue to go upstairs. This only happens when you are above a slab and try to go above the next step (which is a full block with a carpet above it). 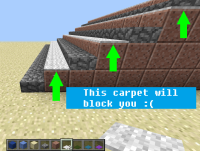 You should be able to go upstairs normally without being blocked by the carpet (as on previously non affected versions of the game). I believe the current behavior is not "work as intended"
Make the carpet hitbox height "zero" again. Please note that this is not a duplicate of bug MC-62170. I believe they are related, but not exactly the same. Bug MC-62170 affected 14w29b and was fixed after that version.